In December of 2013, I flew to Austin again. We actually did have some time to visit and get reacquainted before we ventured out to Texas A&M, but the focus of this visit really was Gari’s veterinary care. He already had a history of dental problems requiring regular tooth trimming, something not uncommon with rabbits and guinea pigs. At Gari’s previous veterinary visit, the dentist determined that his right lower incisor (that’s the big front tooth) was loose. He was also being treated for an abscess and the effectiveness of the antibiotic was not yet known. First he was sedated so that radiographs could be taken. That way we would know if the antibiotic was working to get rid of the infection. Unfortunately, the radiographs confirmed our worst fears: the infection had not abated, and in fact had gone to his jawbone. The right X-Ray had been taken months before, and shows the jawbone nice and tight around the incisor. The left X-Ray is the new one, showing the swollen, spongy jawbone, no longer able to securely grip the tooth. The veterinary dentist, Dr. Dodd, went straight to work and determined that the incisor would have to be removed. He was able to pull the loose tooth very easily. The entire tooth and attached tooth bud came right out, meaning that there would be no new tooth growing back in. Dr.Dodd carefully cleaned the cavity, packed it with antibiotics, and sewed it shut. The capybara incisor is 5-6″ long, but like our own teeth, all but the end is in bone and enclosed in tissue we refer to as “gums.” In Gari’s case, the gums had receded and the bone deteriorated so that it wasn’t really connected any more. That’s why it was loose. Dr.Hoppes immediately took over to trim the teeth as short as possible, to delay the need to return for trimming. During her examination, though, she discovered that the lower molar closest to the location of the removed incisor was loose, and so rotten that pieces broke off if she touched it. It is important to put the harness back on before the capybara regains consciousness! Gari had scabs on his back feet that got bumped and began to bleed, so suddenly, a bandaging marathon took place, now racing the clock as he regained consciousness! Once home, Gari was groggy and confused. In this photo he was deciding whether to go back to the bathroom, forward to the living room and kitchen, maybe not toward me and Melanie’s office and window seat. Gari’s sister, Coral, came by to visit and console him. Melanie brought in his wading pool and set it up so that Gari would have a comfortable place to watch tv with the family. He began to wander between the pool and the window seat and Melanie set out snacks by the window seat when it looked like he had decided to settle there for the night. And back to the pool. We anxiously watched for poop and whether or not he was eating. Finally, Gari began to eat. Finally, four days after surgery, his tummy was full, his digestive system was on task, and he was starting to feel pretty good! We were thrilled to see Gari outdoors, curious and strong, and ready to be a capybara again. This was my fourth and final visit with Garibaldi ROUS. We both knew, and didn’t know, just how sick he was. None of us ever allowed ourselves to believe we were really losing him, and I never imagined this would be the last time I would see him. In fact, he recovered nicely from this procedure, regained his energy and enthusiasm, and even started to eat some of the challenging foods his toothache had prevented. And he never lost the endearing charm and gentleness that was so special to Gari. While you are visiting the Capybara Madness website, take a moment to explore some older posts. Go back to the beginning, when Melanie, still mourning for Caplin, adopted Gari in his time of need. Check out his first days, when he was afraid of the outdoors, when he first struggled with his harness, his trips to the library and school. 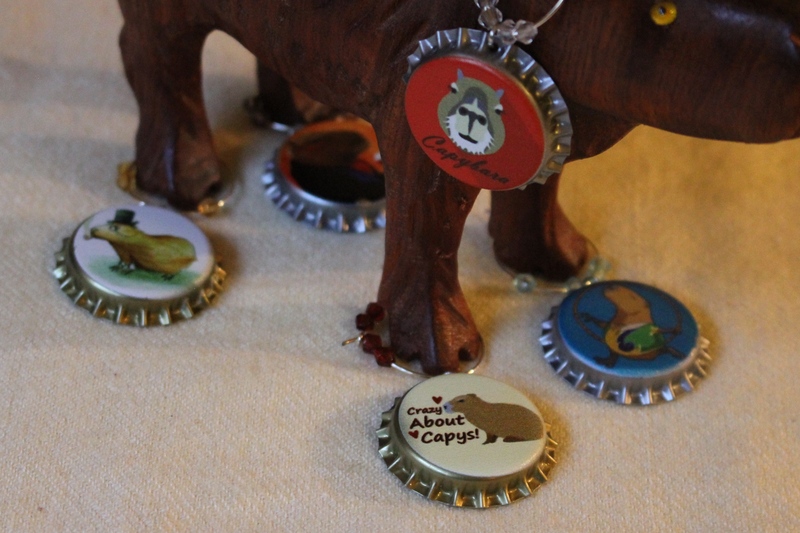 He became a television celebrity, an internet sensation, and set the standards for Capybara Ambassador higher than ever. Mostly, though, he was a good little ‘bara to the end. Thank you for sharing. Gari was a brave and well-behaved capy through all this. Clearly, everything possible was done to help Gari. There should be no regrets. Miss him … please continue posting! After the famous Caplin who was a marvellous capy in his own right; Gari started in a slower way and wormed his way into all of our hearts as his ‘own person’ or should I say ‘own capy’. He will always be remembered for his own individuality and gentleness. Oh my. Its cool though.Wish I could do this to our beloved kitty.